Tonight I was asked an interesting question regarding IronPython (well, Python) and how it handles the loose files when executing. 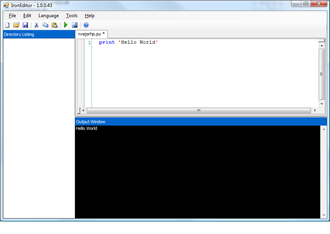 With languages like C#, everything is compiled into an assembly and you have namespaces in order to locate the classes. However, in Python it is a little bit different. In order for the main file to know about the Customer File, we use the syntax – from import . Here we say from the customerfile, import the Customer class at the top of the class. If we execute the file, everything is wrote out as expected. 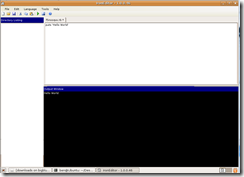 It’s important that both files are located in a directory defined in the path search variable, by default it is the main directory and the Lib directory. If for example, CustomerFile.py was moved into a directory called Customer within the main folder, we would need to add that to the path variable in order for IronPython to look in the directory for the file. The code below does this, note that before we can import os, we need to add a reference to the location of the standard library. Not overly difficult, but I can see new users becoming confused by this. In my previous post I talked about how to get started with IronPython, in this post I want to follow up with some very basic information about the actual language and some tips to enable you to start reading sample code. This post won’t make you an expert, but it should be enough to get you going. One of the great things about IronPython and IronRuby is that there are already a huge amount of resources online about the language. A good starting point (apart form this post of course) is http://docs.python.org/ which contains the documentation for the Python language. One problem with that approach is that there are minor differences different Python and IronPython. 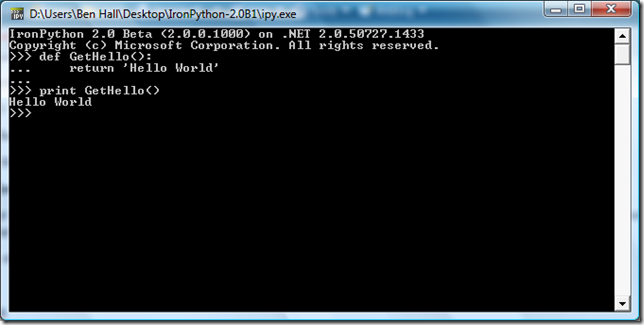 Defining a variable in IronPython seems a logical place to start. The easiest way to play around with the language is by using the interactive console (ipy.exe). What happens is that within the first statement we create an integer object and assign it to x, in the second statement we create a string object and assign it to x, removing the reference to x. However, if we try and mix the types then it throws an exception, here we are trying to add an int to a string. Python does know the type of the variable, it only uses it when it is actually required at runtime (late-binding) as far as I can tell. 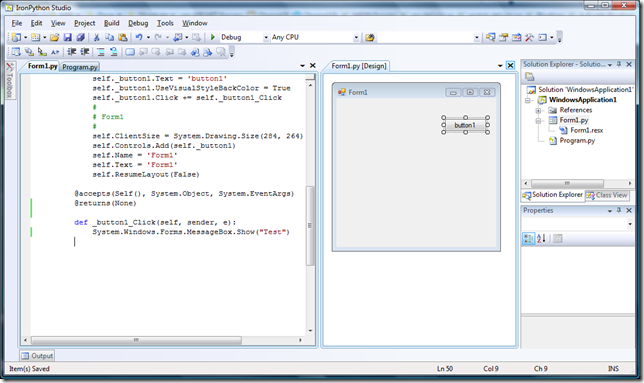 For example, using the type function will return the correct type of the variable. So what does this mean while you are developing, well, it makes unit testing a lot easier as you don’t need to worry so much about getting an object of the extract type – it just needs to look like the type. Also, code is more generic as it doesn’t depend on the extract type. However, you do run the risk of the type being wrong which is only found at runtime – but your automated tests will catch that right? Now we can define variables, the next step is to define functions (methods). While Python is a dynamic language, it still has very strict language rules which must be followed, including it’s important on whitespace and tabbing unlike C#. To define a method, we start with def, we then provide a name for our method, we add a number of parameters separated by commas, no need to include the type as Python will work it out for itself. Finally, we need to end the line with a colon :. Next, we need to fill in the body of the method, the most important thing is to tab in to indicate the body, we can then write a number of lines of code, if the method should return a value then we can include that as the last line. To mark the end of the method, you have another carriage return. Below we create a function called x, with the parameters y and z. In the method body, we just add the two and print them to the output (the console). We can then simply call this method, notice that we can use both ints and strings and the correct action is taken. As we create the method, if we get something wrong then an error will be returned to alert us. Below I attempted to create a method but I forgot to include the colon at the end of the method. Similarly, if we do not indent the function body an error is returned. Below is just an example of how to return a value from a method. Finally, python allows you to create functions within functions, which will have local scope. Great for code re-use and readability! Creating a class is very similar to creating a function. The syntax is class (): In the brackets, we can simply define all of the base classes. We can then define function on the class in the same way, however one change is that we need to include self (similar to this in C#) as the first parameter of the method. If we want to know all the methods on a class, we can do a dir. Everything with a double underscore is an internal method. In the class we can define the actions to take when they get called. Just to sum up, Python is a full featured language, I haven’t even touch onto some of the features of the language but hopefully it will provide you some insight into the code. In my previous post, I discussed Visual Studio Integration, IronPython and how difficult it was to get started. 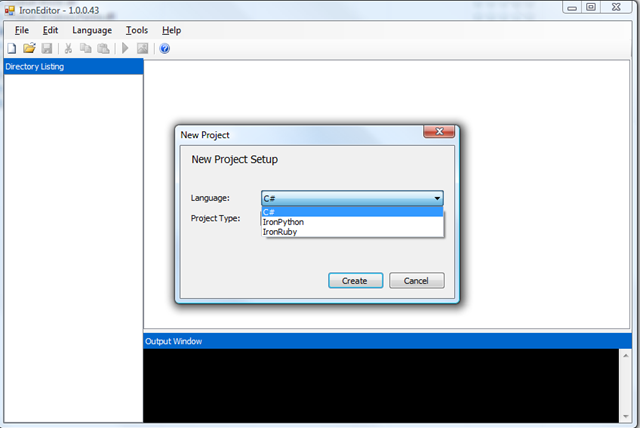 However, I came across an application called IronPython Studio (Colin also pointed it out on the comments) which uses the Visual Studio 2008 Shell to provide a IronPython IDE. 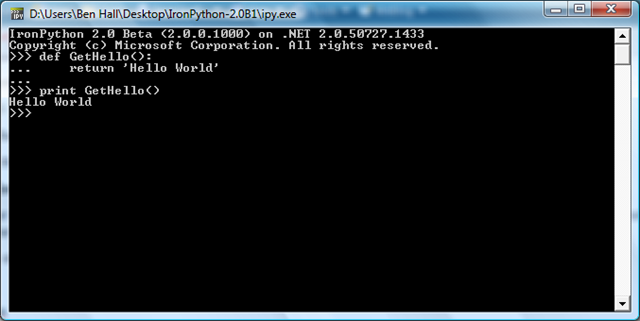 You can download the application from http://www.codeplex.com/IronPythonStudio. Cannot find one or more components. Please reinstall the application. Turns out you need to have Microsoft Visual Studio 2008 Shell (isolated mode) Redistributable Package (http://www.microsoft.com/downloads/details.aspx?FamilyId=ACA38719-F449-4937-9BAC-45A9F8A73822&displaylang=en) installed which the installer doesn’t check for, this is a 384mb download. Installing this, I found that it doesn’t actually install it – if I had actually read it correctly I would have read that it was just extracting. I then had to go into the directory where I had extracted it to (C:VS 2008 Shell RedistIsolated Mode) and run the real installer (vs_shell_isolated.enu.exe). I then uninstalled and reinstalled IP Studio without any problems. 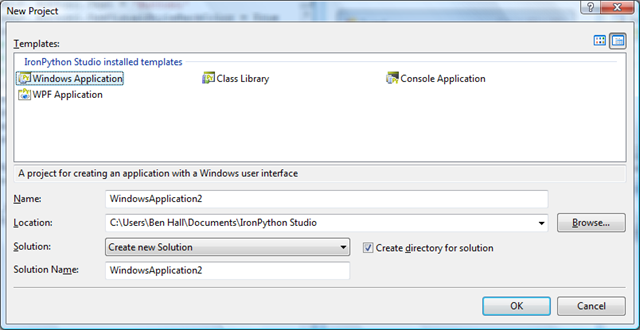 Upon launching Iron Python Studio, I was greeted with a very familiar feel to Visual Studio. Going File > New > Project gave me the same options as was available in the VS 2008 SDK integration. After creating a new Windows Application, it looks and feels the same as VS so you won’t have any trouble navigating around. 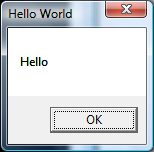 There is some intellisense (it didn’t like System.Windows…) and the syntax highlighting seems to work. 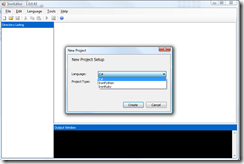 You can build and debug just as you would for Visual Studio 2008 and C#. It is a good application to have around, however for now I think I will stick with ipy and notepad2. The fact you need the VS2008 Shell installed at 385mb is another fact which turns me against this. It’s a shame they didn’t just release it as a VS Package which could plug straight into VS2008.